Now, we are not a wealthy family. Not even close. Where she found the money, I will never know. No doubt it came at the expense of several much-needed home repairs, and perhaps a new pair of boots and winter coat for herself. Nor will I forget how she drove my set down to the theatre on the same morning she was to brief the Minister of Justice on a bill before Parliament. On a rainy spring morning, in her pantsuit and high heels, she and I lugged the flats and risers out of the trunk, up two flights of stairs, and onto the stage. She never pushed me into this vocation. But when I showed an interest, she nurtured it selflessly. Throughout the years, as I wrote and staged more plays, she was always my harshest critic. And the perseverance over political tyranny and prejudice present in these plays is undoubtedly an inheritance from her. So I would like to dedicate this award to my mother. And to all of the hardworking mothers who sacrifice for their children everyday, the world over. In darkness, Peter speaks onstage. My mother always told me: never fall asleep with an unanswered question, lest it haunt your dreams. Sound of a gunshot. It echoes between nearby buildings, birds launch into flight from the adjacent apartment, blood courses through a body. Laboured breathing. A tone, like the sound of a concussion. The digital clock begins to count down from 59:00. Lights appear on Peter Fechter, a youth of eighteen. It sounded like thunder. Like a storm breaking above our heads. And then all of a sudden my mouth was full of dirt. I’ve been shot. No. Yes I’ve been shot. Is there pain? Yes. My stomach. Get up. Do it. Move something. Blink. Yes. I can blink. Breathing. Throat. Can I swallow? No. Hurts to swallow. Right leg. Can I move it? No? Okay. Left leg? No. My weight is on my left leg. Right hand. Yes. Two fingers. I can move two fingers. Now the wrist. I can move the wrist. We’re standing at the window. Two stories above the barbwire fence. The sound of both boys jumping from the apartment window into the Death Strip. …and land on the other side. The sound of them running. A siren. Shouting of Checkpoint Charlie guards. The sound of Peterʼs heavy breathing and pounding heart as he runs; feet on gravel. The other side seems so far. Much further than it looked from the window. Every alarm along the wall, in my body begins to howl, the gravel turns to oatmeal under my feet, run faster goddamn-it, faster! Helmet reaches the other side first. I watch him jump for the top but he misses. He can’t reach it. He jumps again and I grab his legs and push him all the way up. And then I reach for his hand. But he’s already gone over. He didn’t reach down. (The distant sound of the gunshot and its echo) The gunshot echoes across the Death Strip, between buildings, inside apartments, inside every skull for a dozen square blocks, even those of birds in mid-flight and they have very tiny skulls. Goddamn it I should have had a cleaner landing, I should have dodged more, jumped faster, jumped harder. Jump from the knees, that’s what they said in gym class, not that I ever listened. Mr. Hoffman always said it would get the best of me. I thought he meant cholesterol. The thing you have to understand is that Helmet had a plan. And time was running out. Every fiber in my body was telling me to go with him, jump, go now until there was nothing to do but jump. Everything was happening so fast I didn’t have time to think. But now I’m too tired. I want to close my eyes but no, ‘never fall asleep with an unanswered question’. My face in the dirt, whispering: ‘what was worth this?’ I can feel the answer lying in the centre of the hole, the red hot, the part that bleeds, that hurts too much to ahhhhhhhh- need to go to the centre. I take a breath. A long breath. As slow as I can. My mother would say: ‘If you cannot find the answer, then perhaps you are not listening close enough.’ So. I stop moving. I keep very still. I can feel my body melting. Like a rotten piece of fruit. I’m slowing down. Slowing to a stop. To the speed of the earth. I try to listen for an answer. I listen as close as I can. A thousand ants scuttling in the canals of earth below my ear. If I listen close enough I can hear them. An impossible labyrinth of bodies, all moving as part of an intricate system, a master plan. And the roots of a dandelion four feet away slowly descending, searching for moisture. A fly passes overhead, each isolated beat of its wings like a helicopter. A bead of sweat slips from my brow, falls silent through the air, and explodes on the gravel like a bomb. And my heart. Like a drum. Slowly losing it’s rhythm. Pounding blood up my throat. The taste of rusty nails. Of dirt. Sound of a growling stomach. 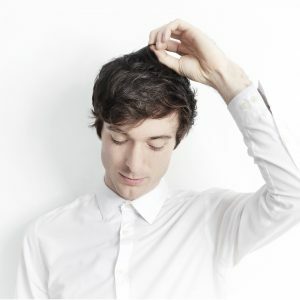 Jordan Tannahill is a playwright, theatre director and filmmaker. His plays, staged in theatres, art galleries, and found spaces, frequently explore themes of gender politics, youth culture, and marginalized identity. His films have been widely exhibited at festivals and institutions including the Toronto International Film Festival, the Art Gallery of Ontario, and the British Film Institute. In collaboration with William Ellis, Jordan runs the alternative art-space Videofag, out of a defunct barbershop in Toronto's Kensington Market.